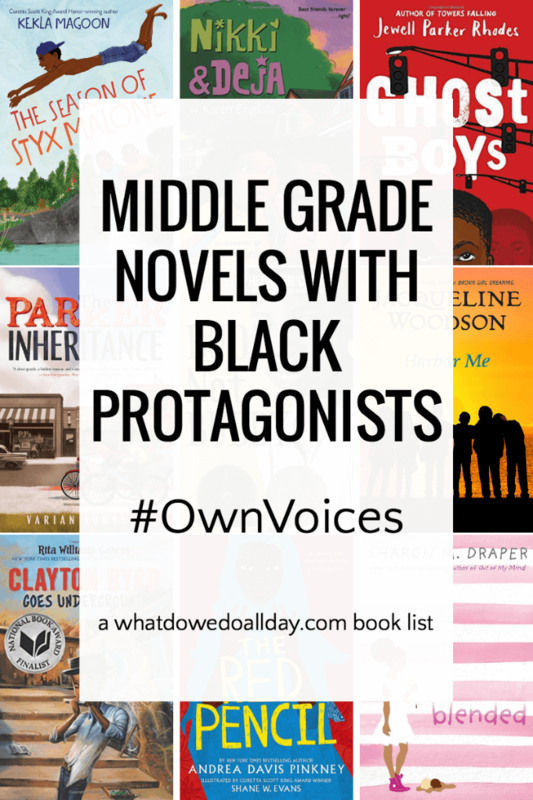 This list of middle grade books with Black protagonists is meant as a complementary list to my book list of picture books by Black authors. Many of the middle grade authors here also have picture books, and vise versa but I didn’t want to duplicate authors. I’ve chosen to focus on contemporary fiction, because as others have noted, characters of African descent are often limited to the stage of civil rights and slavery. However, a few historical fiction titles snuck onto this list. I’m not suggesting we not read historical fiction about the civil rights movement, or about pre Civil War slavery. After all, several of the authors have wonderful historical fiction novels. However, children have the right–and the need–to see themselves in familiar, contemporary settings and not always as historical creatures! 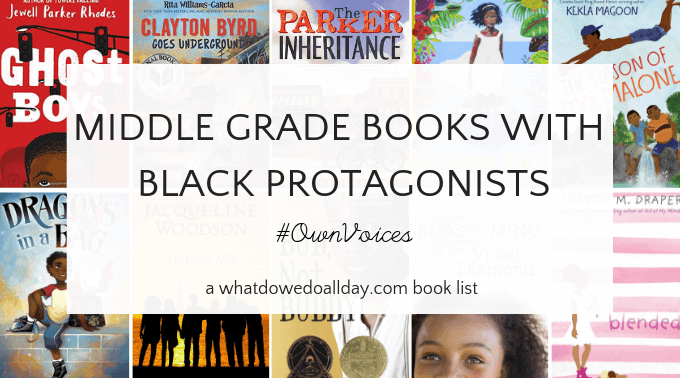 I did not want to duplicate authors with my Contemporary Picture Books by Black Children’s Authors which is why you may think this list is incomplete so check out that list, too. The Parker Inheritance by Varian Johnson. After her parents’ divorce, Candace and her mother move from Atlanta to spend the summer in South Carolina, where her grandmother used to live. Candace is lonely and misses Atlanta. She makes friends with Brandon, a shy 11 year old neighbor and the two of them set out to solve a historical mystery involving Candace’s grandmother. Along the way they uncover a history of racial tension in the small town and an intriguing story of identity and fortune. Be sure to check out Johnson’s other books! Harbor Me by Jacqueline Woodson. Six diverse kids are put together in a room at school as a place where they can talk about the issues they are facing in their lives. Their burdens are as diverse as their backgrounds; incarceration, racial profiling, possible deportation are just a few of the subject the middle schoolers need and want to talk about with each other. Woodson’s prose is gorgeous, almost poetic and the reader will come to care for all of the teens as they tell their stories. National Book Award winner and Young People’s Poet Laureate, Woodson, also has many wonderful picture books. Ages 10 and up. Nikki and Deja. Technically, Karen English’s lovely series about two friends is an early chapter book series rather than middle grade. It’s funny, sweet, and all girls who have a BFF will be able to relate to Nikki and Deja’s friendship and the lessons they learn. Also check out English’s other books, especially her early chapter books series about Gavin Carver, The Carver Chronicles . Ages 7 to 10. Blended by Sharon M. Draper. Isabella is trying to figure out who she is and she feels torn between two identities. Her divorced parents, a wealthy black father and a working class white mother, share custody and Isabella spends alternate weeks at her parents’ homes. A distressing even at school makes immediate Isabella’s search for identity when she knows her sense of self is so much more complicated that the world perceives. You can’t go wrong with books by Draper. The Blossoming Universe of Violet Diamond by Brenda Woods. Violet’s father was killed in a car crash before she was born and she sometimes feels like an outsider with her blond-haired mom and sister, despite their close, loving relationship. Violet decides she wants to meet her African-American grandmother, a well-known artist. She goes for a visit to Los Angeles to stay with her “new” relative and meets cousins and aunts who thoroughly welcome her into the family. Bud, Not Buddy. Christopher Paul Curtis is one my favorite middle grade authors and I loved reading this aloud to my 9 year old. 10 year old Buddy runs away from a series of unpleasant foster homes and sets out to find his father, whom he believes to be a jazz musician. Set in the depression, Curtis’ writing is filled with humor as well as serious truths. Ultimately, it’s an optimistic book, full of laughs and one cannot help but fall in love with Buddy. Clayton Byrd Goes Underground by Rita Williams-Garcia. Clayton idolizes his blues-playing grandfather, Cool Papa Byrd but when he dies, Clayton’s mother sells all his blues memorabilia and prohibits Clayton from playing his beloved blues harp. Upset, Clayton runs away. He ends up on New York City subway, making music with a group of boys, busking underground. As Brave as You by Jason Reynolds. Both my kid and I loved this book about 11 year old Genie and his brother who have come to rural Virginia to spend the summer with their grandparents. Genie is a boy who loves to ask questions and when he learns about his grandfather’s blindness he has a lot to ask! During the summer Genie struggles with making sure he makes the right decisions as he uncovers the secrets of his family’s history. The Harlem Charade by Natasha Tarpley. Tarpley is best known for the seminal picture book, I Love My Hair, but I want you all to know about her fabulous chapter book! Jin, Alex and Elvin set out to solve the mystery surrounding Elvin’s grandfather and missing paintings. This is a spirited tale in which the culture and vibrancy of Harlem is the star. Ghost Boys by Jewell Parker Rhodes. 12 year old Jerome is bullied at school but when a new kid shows up, Jerome makes his first friend. Carlos helps him fend off the bullies with a toy gun and then gives it to Jerome to take home. That evening, Jerome is killed by police officers. Jerome comes back as a ghost and only the daughter of the white police officer who shot him can see him. Together, they work through what happened as other ghost boys appear, including Emmet Till. I highly recommend this book; it examines a timely subject from the experiences of the children involved. Crossover by Kwame Alexander. Alexander’s wonderful verse novel about twin brothers is touching, relatable and extraordinarily engaging. Josh narrates his story of coming to terms with his brother’s new girlfriend, sibling rivalry, the pressure and joy of playing ball and his relationship with his father. This book does have a sad ending and I recommend it for kids ages 10 and up. The Stars Beneath Our Feet by David Barclay Moore. Lolly’s brother was killed a few months ago and Lolly is having a hard time adjusting to life without his sibling. His mother’s girlfriend brings him bags of LEGO, which he takes to his after school program and begins an epic building project. At the same time as Lolly is being pressured by local kids to join the crew that swallowed up his brother, he is learning to make friends with Big Rose, a girl who moves in on his LEGO territory. Moore’s debut novel is a moving story of how our choices move us down paths, and how trauma affects those choices. Hurricane Child by Kheryn Callender. 12 year old Caroline lives in the US Virgin Islands with her father. Her mother left years ago and Caroline doesn’t know where she is. Bullied at school and seeing spirits, Caroline tries to remain fearless and when a new girl, Kalinda, arrives at school, Caroline is determined to make friends with her. When two girls become close friends, Caroline realizes she has strong feelings for Kalinda and confesses to her in a letter. Kalinda is at first frightened off, but then agrees to help Caroline find her mother as a storm brews on the island. The Red Pencil. Andrea Davis Pinkney is best known for her historical picture books for kids. 12 year old Amira lives in the Darfur region of Sudan on her family’s farm. It is 2003, just as war is breaking out in the area. She loves her family and dreams of going to school. When the Janjaweed arrive in her village, the survivors make the long walk to the refugee camp, where conditions are hard. Amira receives the gift of a red pencil and yellow notepad which becomes a catalyst of sorts, both for her spirit and for her mind. The most difficult scene in the book is when the Janjaweed terrorize the village and Amira sees the death of her father. The ending of the book leaves a lot of questions unanswered but curious and thoughtful children will want to learn more. Ages 10 and up. Dragons in a Bag by Zetta Elliott. This is also an excellent choice for early chapter book readers, ages 7 and up. One day, Jaxon’s mom leaves in the care of Ma, a woman who he thinks is his grandmother but is actually a witch on a baby dragon delivery mission. Ma takes him on as her apprentice and they travel to a magical world but when they are all set to return to Brooklyn, Ma is accidentally left behind and Jaxon enlists the help of his friends to take care of the baby dragons and rescue Ma.